Funky feng sui design adds a cool progressive bent to crusty old Bloomsbury. A contemporary hotel at the heart of London’s Bohemian district. Contemporary, eclectic with a smooth and laid-back atmosphere. In a district that is positively smoking with style, it’s only right that you should have a hotel that challenges the occasionally stuffy austerity of Bloomsbury’s ‘period’ properties; so if it’s cosy traditionalism that you are after, you’d be advised to look elsewhere. 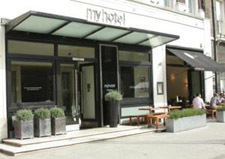 If on the otherhand you’re in the market for slick, progressive lodgings with all the cutting-edge devices you’ve grown accustomed to at home then give the myhotel in Bloomsbury some serious consideration. Through the combined influence of feng shui and funky design by Conran Partners, the hotel offers a creative and occasionally flamboyant take on city lodging. Just a minute or two from Tottenham Court Road Tube Station. Views of Bedford Square and the British Museum in some of the rear bedrooms. Cool and sophisticated ‘feng-sui’ design with a minimal approach to furnishings. 77 luxury bedrooms with a strong boutique aesthetic. Vintage and modern available. Egyptian cotton bedding, wall-mounted TV screens, original artwork and bright splashes of colour. Freshly baked-bread and a melt-in-the-mouth range of pastries served in the ‘Gail’s Bakery’ breakfast room. Gail’s Kitchen open for meals in the evening. Creative approach to some French and Italian Classics. Laid-back atmosphere.